I am pleased to welcome you to the Edgartown Police Department’s website. Our entire police force is dedicated to serving and protecting all of our citizens with respect and professionalism. This website is one of the many ways our department strives to communicate with our community members, business owners and visitors. 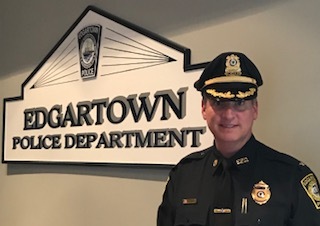 Our goal for this website is to provide you with useful information that will keep you informed and provide you with insights into the Edgartown Police Department and the various services that we proudly provide. I’d like to add that I take great personal pride in being the Chief of Police of such an outstanding law enforcement agency. The dedicated professionals of the Edgartown Police Department truly care about the safety of our community and providing excellent customer service to those that we serve.